Dory? Where’s Dory? When I saw this stamp set while at an LSS recently, I thought immediately of Finding Nemo and the scene with the fish with the hanglybob on its head. I can’t WAIT for Finding Dory! Come onnnnnn June 17th! I hadn’t used my Prismacolor pencils in quite a while, so decided to pull them out for this card. 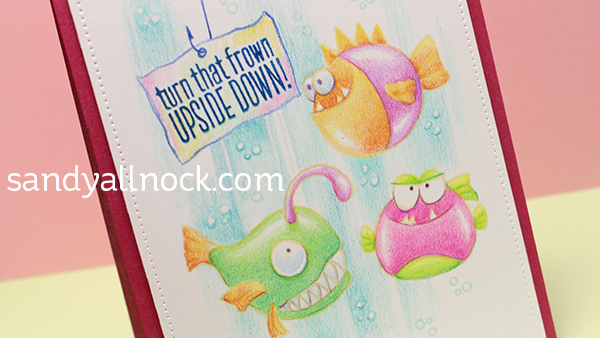 I stamped the images in a very pale yellow (Hero Arts soft vanilla dye ink)….and got going with my pencils! Watch the video below or click HERE to see it in HD on YouTube. I haven’t talked about my Patreon creator page much – but since I revamped that page, and updated some fun new levels of patronage, I figured some of you might like to get involved over there. The new video there has a few peeks at things coming up in the next few weeks, too. Note that it’s now a straight up monthly pledge, not the weird math I had going on before – much easier to understand! 🙂 Pop over for a visit! How darling! I love whimsical images and these are both that and a bit hilarious – my favorite kind! I love to watch your coloring skills. Thank you for the tutorial! Oh my goodness Sandy, I saw this scrumptious card on pinterest and just had to come check out your video. I am smitten with you pencil coloring of these images that I love (when I first saw this set, I just had to have it). I am in awe of your background. Brilliant. 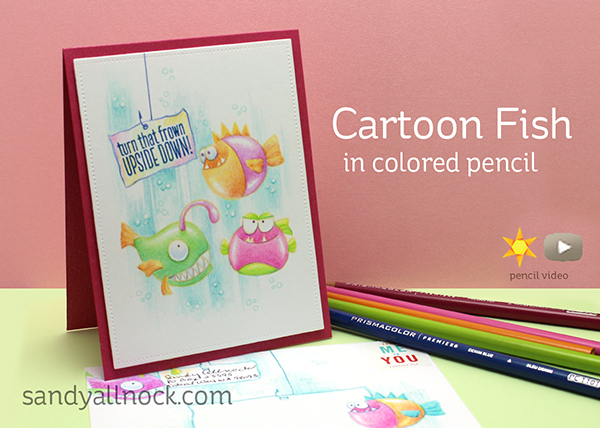 You always help us enjoy the coloring – you make it look so easy. I am still “working on” getting the hang of it, but struggle with my blending. When I use a light hand for my pencils it always is light OR heavy. Hard to get it just right (that’s why you’re teaching us. LOL You are super talented. Thanks for the “pencil lesson”! Sandy, I saw this in my email and was stunned! It is so lifelike, your coloring is phenomenal! I am always in awe when I watch you color whether it’s with copics, pencils or paint. I am inspired to keep working at it and maybe one day will be half as good as you. Sandy, thanks so much for sharing your talent and knowledge with us. You have inspired me to get my pencils out and give them a try! I love your card! “Where’s Dory”, indeed! I was fascinated, watching you leave a highlight around the outer edges of these fish, then blending up to it… I never seem to plan that far ahead!!! But I’ll surely try it – gotta keep stretching out! I don’t have colored pencils, but I’m sure that would work with Copics or any other medium. Oh – my sister is taking your Copic class right now, and loving it! We had fun finding some of the markers online and at a papercrafting store. I’m so glad that we’ll have a new something in common now!!! She honored me by sending her first Copic colored card (a turtle!) to me!!! This is an absolute stunner, your artistic flare is incredible! You have done an amazing job (as always) on this card! Sandy, this card is so cute! I love the coloring techniques used here! I was thinking what would be so cute with this scene to change it up a bit is to take the fish with the light coming forward and make a circle of “light” around the “bulb”. Reminds me of the card you made a while ago where the inside square was bold and the outside of the square had a washed out look, only opposite, making the glowing orb around the fish’s headlamp pale and keep the rest bold. Just thought I’d share! Enjoying your cards and the copic class!! !